This rare Chinese Antique Han Glazed Tower exhibiting warrior and animal features is one of the best we have ever seen and was unearthed from what is regarded as an Imperial tomb. The lasting model of the Han Dynasty's Imperial order remains glaringly evident today among the Chinese, who still refer to themselves as the "Han people." Architecture, vast palatial complexes, towered gateways and city walls were built as symbols of power and prestige and great hallmarks of this period. 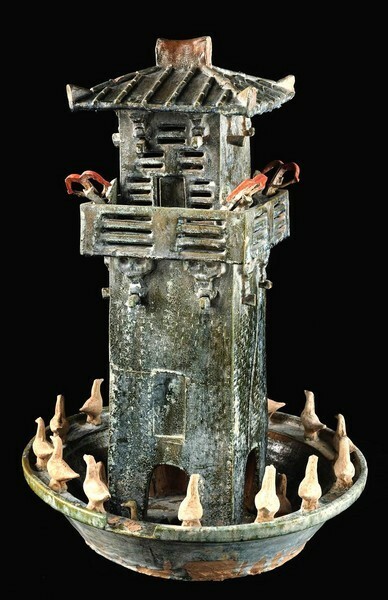 This Watch Tower was part of a burial for the afterlife. 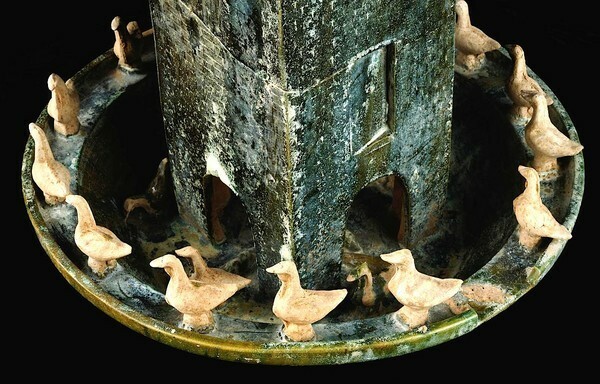 The base of the tower has a surrounding moat with aquatic birds around its perimeter and on each of the four corners in the tower are the warriors with their crossbows aimed and cocked. This was all intended to provide protection from evil spirits. The result of thermoluminescence test certificate by Oxford Authentication Ltd of this Chinese Work of Art is consistent with the above dating.